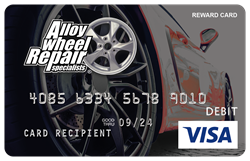 Incentivefox, a leader in customer relationship marketing programs has announced their partnership with Alloy Wheel Repair Specialists (AWRS), a notable standout in mobile and shop-based wheel repair, custom coloring and wheel remanufacturing. Designed to incentivize, we have partnered to create a program that will revolutionize the way AWRS rewards positive engagement and continues to build brand awareness. Through their partnerships with automobile dealerships and repair shops around the country, Incentivefox, with the support of Alloy Wheel Repair Specialists, will expand and increase their ever-growing business network. The referral program is designed to incentivize members of their impeccably trained staff to recommend AWRS’ wheel services to customers during the consultation portion of their visit. On-site, certified AWRS technicians fully inspect the clients’ wheels to properly diagnose and perform the repair or recommend an OEM wheel replacement. This ensures the customer is receiving the highest quality and safest wheel service available for their vehicle. Incentivefox is a Chicago-based marketing company that partners with businesses to build better customer and employee relationships using technology to increase engagement and rewards to motivate behavior. Our adaptable software streamlines referral and retention marketing into one flexible platform offering automated promotions, enrollment, program tracking, incentives and rewards, comprehensive reporting and audience segmentation. With Incentivefox, you are building better relationships and investing in the future of your business.